With the mobile world headed towards mobile-based NFC transactions and payments, Microsoft is not letting itself down. The Windows OS maker has unveiled a new Microsoft Wallet application that comes in to join the likes of Android Pay, Apple Pay as well as Samsung Pay in offering mobile payments services. While Windows Phone devices have really worked their way up to reach the same scales reached by their Android and iOS counterparts in terms of specs and features thanks to the Windows 10 Mobile update, the fact that NFC payments have been a missing element has meant this Microsoft-owned platform lags behind the competition. However, this is coming to an end thanks to the release of the Microsoft Wallet app. 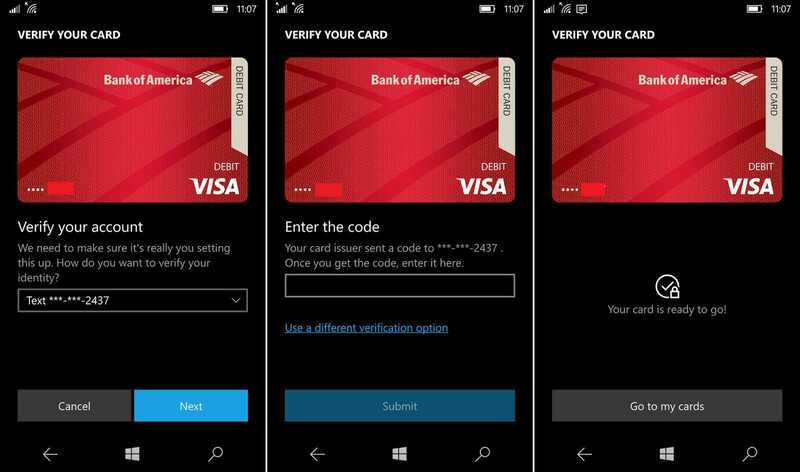 Currently available to Windows Insiders that are using build 14360 or a higher version, the application will allow users of Windows 10 Mobile phones to make transactions with the use of their VISA or MasterCard accounts. The stable version of the Wallet app is expected to show up together with the Windows 10 Anniversary Update that is scheduled for later this summer. Apparently, the Redmond Company says that Microsoft Wallet app can also be used to store membership and rewards cards, all of which can easily be scanned from the screen of your phone. To ensure security is maintained, Microsoft Wallet will follow Android Pay and Apple Pay’s lead by not storing the actual card number on the device. In addition, the entire process of making mobile payments is encrypted. Just like Apple Pay, Android Pay, and Samsung Pay started their campaigns with a limited number of banks on board, Microsoft Wallet has less than 10. As of now, the likes of U.S. Bank and Chase Bank have been listed as “coming soon.” Microsoft has, however, promised that support for more and more banks will be added with time. The company has also recommended that those Windows Insiders willing to try out the new Microsoft Wallet app should also be using the likes of Microsoft Lumia 650, Lumia 950 or Lumia 950 XL.